If a friend or loved one has been arrested and taken into custody in or around the Tournament Player’s Club in Valencia, also referred to as TPC Valencia Golf Course, and you need a bail bond; you’ve probably got a lot of questions and would like some fast answers. At SCV Bail Bonds, a friendly, licensed bail bondsman is ready to take your call and immediately answer your questions and get the bail bond process started. The City of Valencia is home to TPC or Tournament Player’s Club Golf Course. 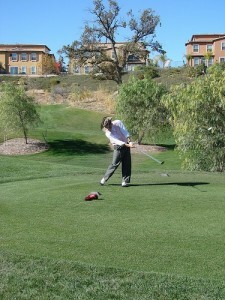 The TPC provides 18 holes set among the rolling hills and oak trees which are famous in the area. TPC provides players not only challenging play, but a luxurious clubhouse in which to relax before or after a game where people can dine, socialize and enjoy the amenities the club provides. For fast information on anyone arrested at or in the area of TPC, call us locally at 661-299-2245 or toll-free at 877-422-4591 any time, day or night. We handle all charges, including DUI’s. The Tournament Player’s Club is located in Valencia, CA and as such, their law enforcement needs are provided 24 hours a day by the Santa Clarita Sheriff Station. Those arrested in or around the TPC are taken to the SCV Sheriff Station for booking and processing where they will be held until their arraignment before a judge. If bail is granted, a bail bond can be posted within 2 to 6 hours, once the defendant has been cleared. If they are not bailed out, it can take anywhere from 24-48 hours (sometimes longer, if weekends or holidays are involved) before a defendant is able to see the judge. In order to minimize your friend or loved one’s time in custody, it is important to get the bail bond process started as quickly as possible. If you’ve never been in this situation before, you may be wondering: what is a bail bond and why do I need one? A bail bond (also known as a “surety bond”) offers financial incentive to the court in order to allow an inmate to continue with their life while waiting for their court date. However, it is possible to receive the discounted bail bond rate of 8% of the total bail amount for those who qualify. The criteria for receiving this lowered fee includes, those represented by an attorney, AARP Members, active Military Personnel and Veterans, as well as Union Members. SCV Bail Bonds is proud to honor this discounted fee for those who qualify. SCV Bail Bonds accepts major credit/debit cards including: American Express, Visa, Master Card and Discover. We also accept cash, business or personal check (o.a.c., at no additional fee), money order, bank account transfer and money wire transfer. We pride ourselves on our creative financing and have many options available in order to fit any budget. If you’re in need of TPC Valencia bail bonds, or simply have questions that you need answered, call us any time 24/7, 365 days a year. A licensed, knowledgeable bail bondsman stands ready to take your call and guide you step by step through this difficult time. We can be reached locally at 661-299-2245 or toll free at 877-422-4591. We’re proud members of the Santa Clarita Chamber of Commerce and the California Bail Agent’s Association. Our convenient office is located directly across the street from the Santa Clarita Sheriff’s Station Jail at 23734 Valencia Blvd., #300 in Valencia. See why choosing the right bail agency can make all the difference to you!